Junior Volunteers play old-fashioned games, demonstrate chores and other activities related to a child's life in the 19th century during the museum’s Summer Season (April through October). Applications are accepted year-round with training in the winter months. Mandatory parent/guardian informational meetings are held in early February. Volunteer commitment is one three-hour weekend shift during the school year in April, May, September and October and two three-hour shifts in June, July and August. or complete our online Junior Volunteer Application. Building Interpreters tell the stories of the past and how they relate to the present inside the historic museum buildings. 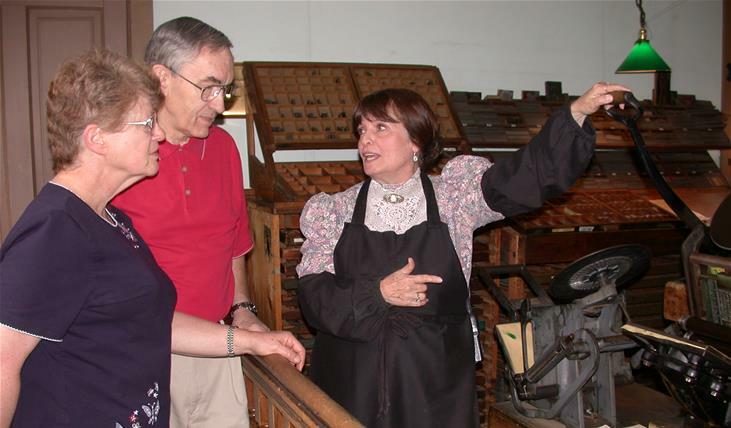 Through their interpretation, these volunteers provide an exciting and engaging experience that stimulates conversation and promotes an appreciation of Naperville’s history. Applications are accepted year-round. The winter training season begins in late January/early February. The summer season training begins in early June. Additional volunteer opportunities are available during the winter season (November through March). Training is required for these roles. or complete our online Volunteer Application. History Connectors will work with our staff on hands-on activities, which include activity carts, specialty days, Camp Naper summer camp (must be approved by Camp Supervisor), Scout programs and more. Applications are accepted year-round. The winter training session begins in late January/early February. The summer season training begins in May. During the Summer Season, the museum is open Tuesday–Saturday between 10 a.m. and 4 p.m. and Sunday from 1-4 p.m.